A foal nurses from a mare at the Lindenhof Stud in Brandenburg, Germany. While mare's milk remains a niche product, its reputation as a health elixir is causing trouble for European producers in a more regulated age. Goat's milk. Sheep's milk. Soy milk. Almond milk. The grocery store shelves these days are filled with alternatives to dairy from cows. But in Europe, interest is growing in milk from a surprising source: horses. While the idea of sipping mare's milk might sound unusual to Western readers, it's been a traditional staple in Central Asia, where it is often fermented into "koumiss," a mildly alcoholic drink that was adopted by Russian doctors in the mid-19th century as a treatment for tuberculosis. Patients no less illustrious than the writers Anton Chekhov and Leo Tolstoy swore by its curative powers. In Europe today, mare's milk remains a niche product, but its reputation as a health elixir is causing trouble for producers in a more regulated age. That includes dairy farms like Lindenhof Stud, located in the lush countryside of Brandenburg, Germany, a 45-minute train ride outside Berlin. The elegant bays, grays and chestnuts that wander over to nibble at my pockets are pedigreed sports mares. And their milk is consumed not just by their foals, but by humans. "We couldn't start our own business 'til socialism ended," Lindenhof's owner, Siegfried Dörge, says. "And then in 1991 we bought mares to breed and to milk." Hand-milking the 10 mares takes him just half an hour a day and provides another income stream to supplement boarding, riding holidays and sales of the farm's award-winning horses. 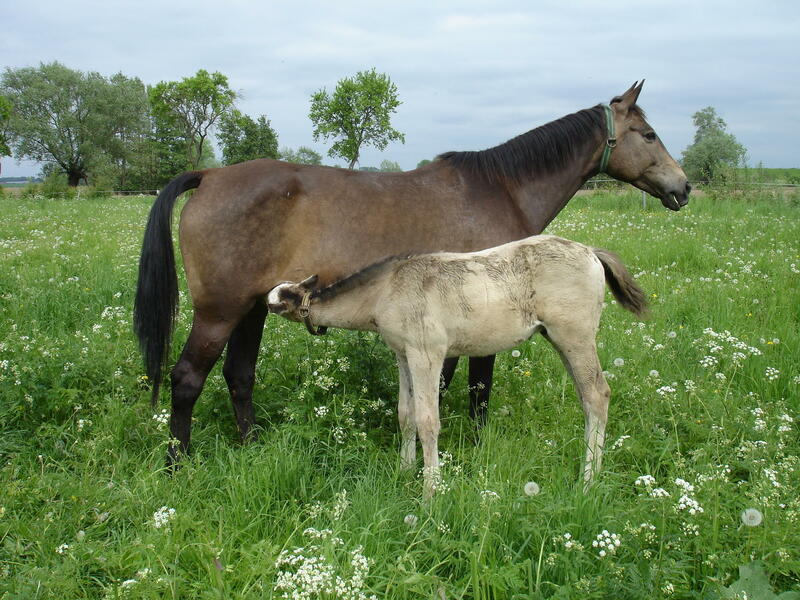 Each mare gives about a liter of spare milk a day and will only lactate when her offspring is at her side, so the foal stays with his mother until he's naturally weaned. The milk is flash-frozen in quarter-liter packs at minus 22 degrees Fahrenheit and sold either direct from the farm or via organic grocery stores. It is high in vitamin C and iron but low in fat, with levels of lactose and casein that are closer to human breast milk than cow. There was no milk for me to taste yet when I visited, but fans say it has a sweet, slightly nutty flavor, like almond milk. There are only about 30 mare's milk producers in Germany and more scattered across Europe, chiefly in the Netherlands, Belgium and France, although few countries have national associations and there is no pan-European organization. Dörge follows the same German regulations for producing certified raw mare's milk as he does for raw milk from cows, goats and sheep, and he constantly tests for impurities. His vigilance makes the milk pricey at nearly 10 euros (or nearly $12) a liter, but he has regular customers who come from as far as Hannover, some two hours away, to stock up. Often the clients take mare's milk to relieve skin or digestive problems. Peer-reviewed papers suggest mare's milk can objectively improve atopic dermatitis or eczema. A few studies in rats suggest that koumiss reduces mercury toxicity and that plain mare's milk enhanced rats' immune responsiveness. But no one has yet been able to pinpoint any anti-inflammatory effect on the human digestive system, despite the enthusiastic reviews from customers on some producers' websites. Siegfried Dörge has one customer who has been purchasing mare's milk from him for 20 years. "If he stops drinking it," Dörge says, "he gets terrible eczema once again." "If I could promote mare's milk as a medicinal product, I would probably sell three times as much," Dörge tells me, but EU regulations forbid all food producers from making curative claims. He isn't even allowed to link to the relevant studies on mare's milk from his website. "We are at the eye of a hurricane," says Julie Decayeux. She's the only European producer selling fresh pasteurized mare's milk, and she also exports powdered milk around the world. The Belgian farmer established an equine dairy called Chevalait in Normandy, France, in 2003 to preserve the local draft horse breed, the Percheron, and is now one of the largest producers in Europe, with 200 mares. "After the [Second World] War, with the Marshall Plan, French farmers bought tractors and sold their horses," Decayeux says. "Now there are nine draft horse breeds left in France and they are very fragile. At Chevalait we put the horses first. We're not here to make money from the horses. We are here to breed good Percherons, and the only way for that to work financially is the milk." In any case, she adds, if you do not respect the horses, they will not produce much milk: "They are not genetically programmed to produce milk like a cow. You need a relationship with them for them to share their milk with you." At first, mare's milk was a hard sell, and Decayeux had to attend agricultural fairs and salons every weekend to publicize it. But then word spread and Chevalait built a market for itself. She weaned her two youngest sons on mare's milk, and uses it to cook everything from béchamel sauce to chia pudding. Decayeux estimates that some 40 percent of Chevalait's customers are dealing with skin conditions like psoriasis or eczema or inflammatory bowel problems like Crohn's disease, but 60 percent are parents feeding babies with allergies to cows' milk. But while peer-reviewed studies suggest that mare's milk can be a safe substitute for most children with allergies to cow's milk, Chevalait can't make this a selling point, either. Under another EU regulation, food producers can only make nutritional claims about their products if those claims have been confirmed by the European Food Safety Authority (EFSA), which researches scientific claims and independently advises the EU. Decayeux says she recently received a letter from French officials "telling me that I must remove any wording from our website that says mare's milk is the closest milk to breast milk, or else the site will be shut down." Mare's milk producers want to see more scientific studies into the potential medical benefits of their product, but that kind of research is costly, Rainer Schubert, chairman of the German Association of Mare's Milk Producers and a retired lecturer in human physiology and nutritional medicine, wrote in an email. He calculated that any formal, rigorous medical study would cost some €350,000 [$412,000], and there's no big European mare's milk industry to underwrite the expense. There's more science already available to support the nutritional case for mare's milk as a breast milk substitute — but Decayeux needs to jump more regulatory hurdles before she can legally make those claims. The farmer is unbowed. In April, Chevalait had a visit from the regional president of Normandy, France, Hervé Morin, who wants to help save the Percheron from extinction. In June, Decayeux spoke about mare's milk for babies at a European Horse Network working group at the European Parliament in Brussels. The Horse Council of Normandy will present a dossier concerning the nutritional properties of mare's milk to the EFSA for validation. But she says it will take two to three years for producers to get official approval to market mare's milk for infants. Despite the delay, the tiny industry seems poised for change. In March 2017 the European Parliament voted to formulate guidelines for standards and inspections at European horse and donkey dairies, a move that Schubert thinks will help. "It could lead to an increase in awareness of mare's milk and in sales," he says. And Julie Decayeux remains an undaunted evangelist. "I am 52 now and this is hard work, so we are looking for partners to develop the market," she laughs. "We're asking people all over the world to think about opening mare's milk farms — in America, in South America, in Africa. Why not?" Susanna Forrest is the author of The Age of the Horse: An Equine Journey Through Human History.